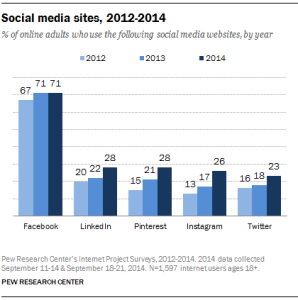 Facebook is #1 Marketing Platform in World: Is it All it’s Cracked Up to Be? More and more brands globally continue to jump aboard the Facebook social network promotion bandwagon to hopefully drive new business and increase sales. With Facebook being the #1 Social Media powerhouse in the world, it isn’t a question anymore if businesses should plop down advertising dollars on this most popular foray. What can be intimidating is trying to ensure you’re using the right Facebook advertising options at the right time to the right audience, especially in this ever-changing social media landscape. To make the scenario just a little more challenging, Facebook is very conscious of not chasing away their more than 3 billion users with a barrage of ads by striking a balance of devoting less space in favor of quality advertisements while not missing a step feeding their cash cow. Let’s take a quick trip to see how rapidly Facebook has advanced since its advent a little over a decade ago, especially when paid advertising entered the picture. “Flyers” were introduced during the first year of Facebook as its first quasi-advertising product serving as a makeshift promotion board for activities and events on college campuses. Soon afterwards Facebook became available to everyone and then “Pages” soon began hitting the scene in 2007. That same year Facebook launches Facebook Beacon with 44 partner sites which served as the base of Facebook’s advertising core that received data from external websites. At that same time Facebook had 100,000 business pages which started as group pages. In March 2008 Facebook hired COO Sheryl Sandberg who collectively brainstormed with Facebook employees and concluded that advertising would be the main source of profit expansion with a host of different options for targeting customers such as “Lookalike Audiences,” “Dark Posts,” and retargeting ads. In 2012, Facebook started showing advertisements called Featured Posts in the news feed for pages Facebook friends engage. That same year Facebook accredits advertising as the reason profits jumped from 65% ($1 billion) the previous year to almost 90% ($3.71 billion.) Current figures now include 56% of its advertising revenue coming solely from the U.S. and 1.5 million active Facebook advertisers. The question isn’t who is Facebook’s target audience–but who isn’t?! According to Jon Loomer (2014), as a small business, when I have a product to promote, I find my Facebook fans buy at a very high rate. On the flip side, people on Facebook who are less likely to know who I am (and trust me) are far less likely to buy. During the past 30 days, I spent $297 on Facebook ads that returned $10,510 in direct revenue when I opened up a pre-pay product for 50% off the eventual price. I ran 11 total campaigns–one (each) “Dark Post” that targeted a Lookalike Audience, Custom Audience and Partner Categories; one “Promoted Post” that targeted non-fans with similar interests; one sidebar FBX ad targeting users who visited any page of my website; and six “Promoted Posts” or Dark Posts that targeted fans only. While the results were incredible when targeting fans, with non-fans I had no returns at all with 14 different ad variations. Why Facebook Page Likes Still Matter. Purposely Cutting Back Ads but Increasing Revenue…How’d they Do That?! There are approximately 20 million businesses that now have Facebook Pages. Why? 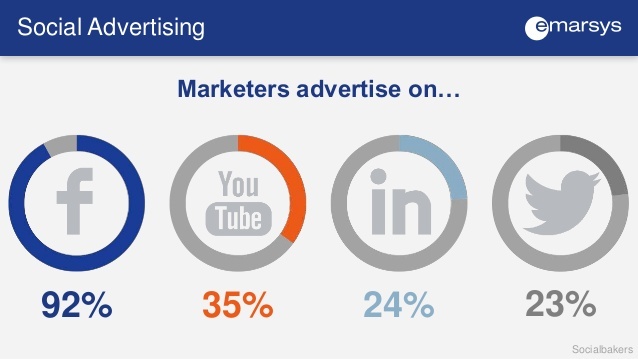 Because although most online advertising reaches only 38% of its intended audience, Facebook’s average is 89%. The bad news for businesses is for the past two years, the average price for a Facebook ad has been on a steep incline, while the number of ads the company serves has dropped. In the fourth quarter of 2014, Facebook’s average price-per-ad rose by 335%, and the number of ads it served fell by 65%. While Google, Yahoo and many digital media companies are trying to squeeze in more ads to make money, Facebook has gone the other way by cutting the number of desktop ads displayed on its right rail and news feed ads. Despite this move, Facebook has managed to grow its average revenue per user. CEO Mark Zuckerberg said during the company’s earnings call in January, “Instead of pushing ad quantity, were emphasizing ad content quality.” The ability to raise prices has rocketed Facebook’s overall revenue to $3.85 billion in the most recent quarter. Advertisers poured $3.59 billion into the company last quarter, 53% more than they spent a year earlier. (Petersen, 2015). Facebook’s Mobile Revenue climbs to $2.5 billion as Ad Prices Soar. So how much does Facebook advertising cost and what are my options? This is where it gets confusing because there is no set ad schedule, pre-payments or rates. It’s all computed on an individual basis for each business. After a business determines its budget, they proceed with tailored options based on a number of factors that can affect cost including live auctions. Stay with me now…Afterwards you manage multiple targeting options at the ad set level by choosing location, gender, age, likes and interests, relationship status, workplace and education of your target audience. Ads can also be targeted to those already connected to your company. 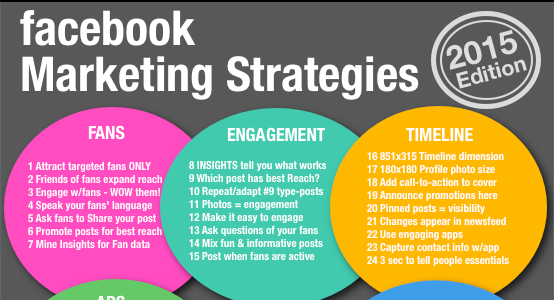 According to Facebook, a boosted post is a way to reach many people within the budget and targeting preferences you’ve set. You can also use the Create Tool by inputting targeting information to see how it affects your potential reach and afterwards choose a budget and schedule including the estimated number of people your ad can reach per day. As far as how bidding works, you can use automatic bidding so that it’s optimized to help you reach your objective. Using manual bidding will let you select a maximum bid. Advertisers can also choose pay per click (CPC) or per 1,000 impressions (CPM) or conversion. Where it gets even more befuddling for the average advertiser is how auctions compete against one another by an ad’s competitive value which is a combination of the advertiser’s bid and the ad’s intrinsic quality bid, which represents user sentiment as a good experience. The ad’s intrinsic quality bid is the measure of engagement an ad brings to the Facebook ecosystem. As mentioned above, this helps ensure that the user has a positive experience and is captured through clicks, likes, shares, and user feedback. Don’t let this riddle that only the sphinx can unravel dissuade you —there are many qualified members on the Facebook sales team that can walk you through the demystification process. According to Forbes, (2014) Facebook Ad Revenue gets boost with More Relevant Ads by utilizing user data generated outside its own platform, similar to Google and Yahoo. Because of some privacy concerns, Facebook makes it optional to opt out so brands are expecting that making more relevant ads will keep audiences interested. So far, improved ad targeting has helped Facebook deliver strong return on investment (ROI) to marketers and advertisers which in turn commands higher priced ads which are generally more aesthetically pleasing and less annoying as they appear to be a part of Facebook’s usual news feed. Facebook is also very emphatic about bucking the industry standard and only charging for ads seen by human eyes. “Actually, that might seem pretty obvious, but even though there have been efforts to move in this direction, the industry has historically focused on ads served, even if they’re at the bottom of a web page and no one sees them. Now, when we talk about Facebook advertising, we’re talking about a few different things — there are the ads on Facebook itself, and then there’s the broader ad platform that the company is building, particularly its Audience Network and the relaunched Atlas, which basically bring Facebook ads and ad technology to outside websites and mobile apps. (Ha, 2015). Facebook says Advertisers Should Only Pay for Ads Seen. Mobile is now the primary focus shift in Facebook’s ad strategy and instead of launching new ad products, Facebook is improving current ones. More niche audience targeting, higher engagement and better click through rates give them strong leverage when it comes to negotiating ad prices. The Facebook share of the global mobile market is currently 18.4%. 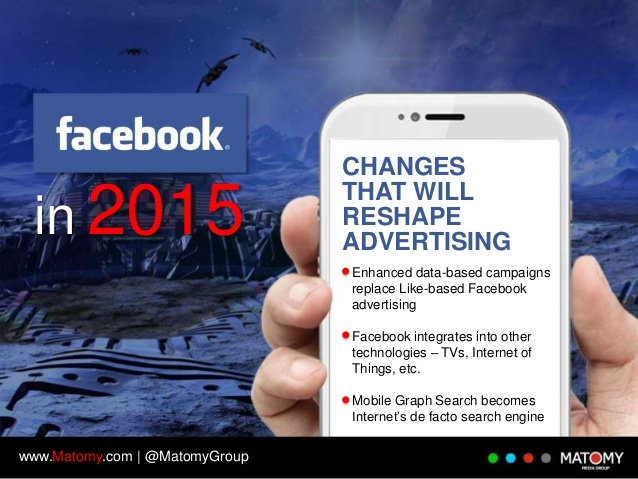 In 2014 Facebook launched its new mobile Audience Network and local awareness ads. Facebook claims local awareness ads are more cost-effective than traditional advertising channels like newspapers and broadcast media, plus they offer “more precise targeting and greater reach.” Facebook says these new ads are “built with privacy in mind” – advertisers never see a list of specific people, and users can choose not to share their location with the social network. (Protalinski, 2014). Facebook Launches Local Awareness Ads to let Businesses Target Users Nearby. 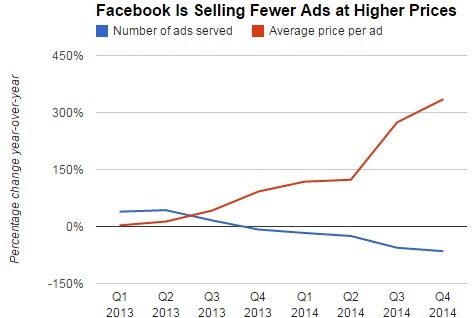 There are two big reasons Facebook has been able to sell fewer ads at higher prices: mobile and data. 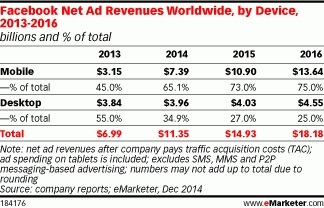 2014 Q4, 84% of the company’s daily audience visited on a smartphone or tablet, while 69% of the company’s advertising revenue came from ads shown on such devices. (Petersen, 2015). The less an ad feels “pushy,” the more relevant the brand will become for audiences. “The brands that are still taking out ads on Facebook like it’s the classified section of a newspaper are the ones that are losing in the new advertising reality. Brands have and need more creativity leeway on Facebook, much different from the way they would pitch products on television, radio, or print. People like to interact with things that they can rally behind like funny, sad, educational and empowering things. (Gupta, 2015). Charging More for Facebook Ads Will Challenge Marketers to Produce better Content. “For the last 4 months, I’ve been tinkering around with Facebook ads for a social gaming company. I’ve managed to run mobile-only and desktop-only campaigns that have the exact same creative, copy, targeting, and even max bids. Both campaigns were set up according to 3Q Digital’s Social Pyramid structure, which tiers bidding from highest to lowest for customers, fans, website visitors, and customer-based lookalike audiences. Even though the overall reach on mobile is 31 percent greater, Facebook’s algorithm ups the frequency quite a bit and ends up serving more than double the impressions. You would expect CTR (click-through-rate) to suffer because of this, but it is in fact 71 percent better, probably due more to the effectiveness of the mobile ad unit more than anything else with almost tripled conversions.” (Yoo, 2015). Case Study: What you Actually get with Facebook Mobile Ads. If you want to save yourself some time, money and frustration, here are the five things anybody must know before advertising on Facebook: 1) Set up a Facebook Fan Page for your business or brand; 2) Identify your target market in terms of ‘niches’ that are more inclined to use your product; 3) Your website landing page needs to compelling convey your goal; 4) Create a few ads and split test them to see which one does best in completing your call to action; 5) Measure by using Facebook’s conversion tracking through your Facebook Ads Manager. (Burd, 2015). 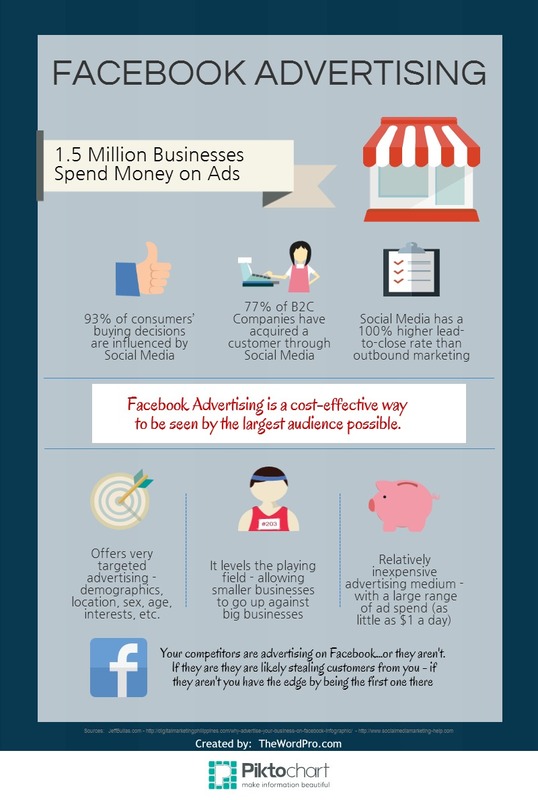 5 Things Any Business must know before Advertising on Facebook. https://www.youtube.com/watch?v=2_QXFAKB3Kk Here’s a good look at nine ways to improve Facebook advertising including how often you should update, the types of adverts you should use and how to effectively target campaigns. Integration with other social channels? Needless to say, the media powerhouse isn’t going to include competitor channel links on Facebook like Pinterest, Google+ or Twitter. Specifically, Facebook bought Instagram for $1 billion in cash and stock, making it the social network’s biggest acquisition to date. In 2013, Facebook officially launched an Instagram ad platform. With Instagram, Facebook became a formidable mobile player – an area that the social network has since dominated, with Facebook announcing in April 2014 that it hit 1 billion monthly active mobile users. The focus for Facebook integration with other social channels they own includes Whatsapp, and Snapchat. In the video department, Facebook surpassed YouTube in the number of views via desktop in August 2014 according to comScore. It’s important to note that YouTube still has more views across all devices. As of September 2014, Facebook attracted a billion video views per day, a roughly 30-fold increase in three months. Also, Facebook videos receive significantly more shares than YouTube. This makes sense because sharing and engagement are at the heart of Facebook interactions. King, C. (Jan 1, 2015). 28 Social Media Marketing Predictions from the Pros. strategic integration, channel and audience integration, and message integration. With strategic integration of Facebook and email marketing you can even derive the value of your overall Facebook marketing effort by examining it through the prism of your existing email marketing investment. With channel and audience integration of Facebook and Email Marketing the goal is not to get an email opt-in or a Facebook “Like,” the goal is to get both. For message integration of Facebook and Email Marketing there are tons of options here for using (and re-using) your Facebook and email content. You can use email subject line testing to optimize Facebook ad headlines and vice-versa. You can also do the same to test image effectiveness via email. Just like Sponsored Stories, incorporate fan expressions of advocacy into your email content. Incorporate most popular email content into status updates and vice-versa. Don’t forget to tease upcoming emails via status update (Baer, n.d.) Killer Integration of Facebook and Email Marketing. Major Companies Using Facebook Advertising Effectively? Doritos – Achieved a great reach and Nielsen Brand Effect results showed a 30-point increase in ad recall, a 6-point increase in brand recommendation and a 9-point increase in brand consideration. Pepsi Max – Main measure of success was how many people engaged with the content and viewed the video featuring Dynamo the magician which reached 18.7 million unique people; 2.4 million paid media video plays; 600,000 viral video plays; 23% engagement rate with more than 100,000 shares/likes. McDonald’s (Sweden) – Over a two-and-a-half year period, Facebook drove strong results for McDonald’s Sweden; 2/3 of McDonald’s incremental sales driven by Facebook came from long-term branding impacts with paid media driving the most sales. Nissan – Nissan was the first auto manufacturer to use the “logout experience” in the Australian market, and as a result, saw 22% uplift in awareness of Nissan with the core demographic; More than 31,500 videos played during the campaign; 47% of total target audience was reached, with 97% targeting accuracy; 5x increase in customer engagement compared to a similar campaign earlier in the year; 25,000 new Facebook fans acquired. Bud Light – A Datalogix ROI study measuring the actual offline sales lift resulting from the campaign across 100 million consumers on a one-on-one level found a 3.3% sales lift among households exposed to the ads versus the control group; 6X return on advertising spent; 22.8 million U.S. households were reached by the campaign, representing 20% of total U.S. households; 18x increase in reach for the “smartphone Bud” to 16 million unique users after the post was distributed with Facebook media. Just about every celebrity has a Facebook presence, Chances are there are plenty of videos the rich and famous post that are more likely viewed by the masses like the one comedian Kevin Hart posted on his page of him with Will Ferrell and Jimmy Fallon lip-syncing that has been viewed 14 million times. I’m not familiar with any celebrity taking out a Facebook ad but FB has approached many sports professionals, newscasters and actors with different campaigns to support their advertisers. As an example, during the super bowl these famous people participate by posting pictures and commentary at the “WatchWith” party using a “#FBWatch” hash tag. In return, Facebook has been explicit about its pitch: Publish with us, and we’ll pay you back with eyeballs. This includes amplified distribution on posts to their FB Page fans, prospective fans, exclusive access to new FB Pages app to facilitate the posting via mobile and enable fan engagement, as well as press partnership to highlight participation in “Watch With” program. Kafka, P. (Jan. 31, 2014). Here’s How Facebook Rewards Celebrities who Post About the Superbowl. What’s on the Horizon for Facebook Advertising? Speaking of celebrities, Facebook thinks they’re worth more money to convince experts and influencers to like something. Facebook’s just patented in February one of the trickiest ways yet to identify top influencers. Facebook watches the rate at which a piece of content is shared, then figures out whose posting led to a sudden increase in share rate in their network. Facebook will then target those people with ads and presumably charge businesses a boatload to reach them. Other tech giants like Google, Yahoo, and Microsoft have received patents for “Influencer Marketing” but none use as clever of a technique to determine who true VIPs are. Facebook’s method doesn’t require participation (or even consent). If you’re famous, and on Facebook, now it knows how to put a price on your head. (Constine, 2015). 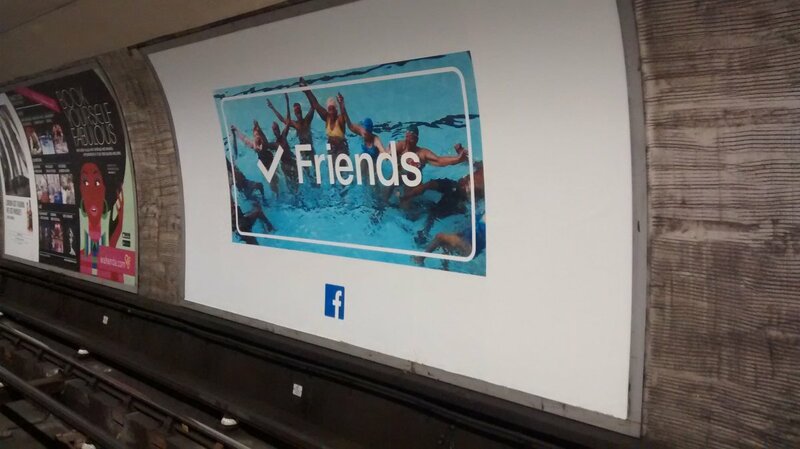 Facebook patents clever way to advertise just to important people. Wendy’s VP of digital and social media Brandon Rhoten has spent the past decade trying to move the fast-food chain’s TV ad budget online. It hasn’t been easy. “Moving dollars from traditional advertising to digital is not as effective because you can’t guarantee the impression. It hurts our case when you have headlines reading 25% or 50% of impressions are never actually seen.” That’s a problem for major ad-supported digital media companies like Facebook that are counting on TV advertisers bringing their budgets online — not to mention to mobile, where users are migrating far more quickly than marketers. Just 44% of ads served on the mobile web during the fourth quarter met the Media Rating Council’s (MRC) viewability standard, according to an analysis by digital measurement firm Moat. Wendy’s, ZenithOptimedia, the Interactive Advertising Bureau, Nielsen, Digitas, Starcom MediaVest Group, IPG Mediabrands, Google, Yahoo, ABC and NBC and L’Oreal are among 150 companies who are a part of the MRC to develop the new mobile and in-feed viewability standards and hope to have a draft by the end of 2015. Facebook doesn’t measure a view according to the MRC’s standard. Facebook counts an ad as viewed, regardless of how long it’s actually in view. (Peterson, 2015). Facebook, MRC Working to Clear up Mobile Ad Viewability. Facebook just began in February to give advertisers a new tool to better compete for the social network’s expensive and scarce ad slots. Facebook will tell advertisers on a scale from 1 to 10 how relevant their ads are so advertisers will be able to monitor their scores and tweak less relevant ads to become more relevant, potentially boosting the ad’s performance and lowering its price. Positive measurements include video views, shares and clicks. Negative measurements include the number of times people click to hide an ad or report it as spam. This move appears to be the latest way Facebook is trying to get a grip on the firehose of content flooding people’s news feeds. (Petersen, 2015). Facebook Starts Telling Brands how Relevant their ads are. Burd, T (Jan. 27, 2015). 5 Things Any Business must know before Advertising on Facebook. Constine, J. (Feb. 16, 2015). Facebook patents clever way to advertise just to important people. Gupta, K. (Feb 10, 2015). Charging More for Facebook Ads Will Challenge Marketers to Produce better Content. Ha, A (Feb. 15, 2015). Facebook says Advertisers Should Only Pay for Ads that get Seen. Kafka, P. (Jan. 31, 2014). Here’s How Facebook Rewards Celebrities who Post About the Superbowl. King, C. (Jan 1, 2015). 28 Social Media Marketing Predictions from the Pros. Petersen, T. (Jan. 27. 2015). Facebook Tells Marketers that Clicks don’t matter, Sales do. Petersen, T. (Jan. 28, 2015). Facebook’s Mobile Revenue climbs to $2.5 billion as Ad Prices Soar. Petersen, T. (Feb. 11, 2015). Facebook Starts Telling Brands how Relevant their ads are. Peterson, T. (Feb. 18, 2015). Facebook, MRC Working to Clear up Mobile Ad Viewability. Protalinski, E. (Oct, 7, 2014). Facebook Launches Local Awareness Ads to let Businesses Target Users Nearby. Toner, L. (Sept. 26, 2013). The History of Facebook Advertising. Yoo, D. (Feb. 20, 2015). Case Study: What you Actually get with Facebook Mobile Ads.